Bananas are full of potassium, protein and the ability to lower blood pressure, this fruit is one eaten by many all over the world. Americans tend to eat as many bananas as apples and oranges together. In the 1950s, the Gros Michel banana was the most-exported banana in the world until a fungus known as banana wilt ravaged the banana population. 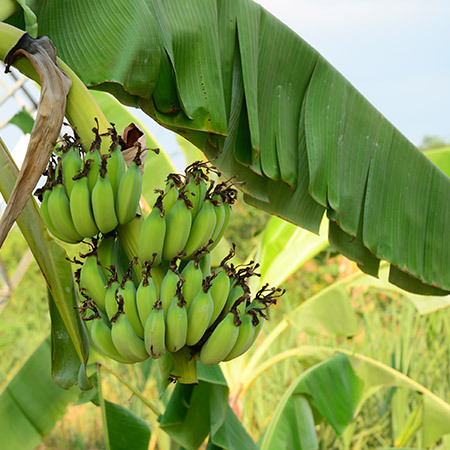 The banana that we eat today is the Cavendish and is the replacement for the Gros Michel after it was led into near extinction by the fungus Fusarium oxysporum. It’s spreading across Southeast Asia, Australia and the Middle East, where bananas are grown. In the 1950s the banana industry almost completely collapsed because of the fungus, and through switching to the Cavendish they were able to keep the industry going. The banana is being infected by the fungus once again. There is no cure and no spray that will fight the disease. The fungus is one that dwells in the soil, attacking the roots of the plant. Eventually it clogs the xylem, where water is transported into the pla nt. It is a fungus that spreads slowly, and travels at 55mph to all the different corners of the world that it can infect bananas. The spores can remain for decades, and with no treatment, cure or spray the land will be abandoned by the famers. Eventually, moving onto untouched corners of the rainforest became impossible, as they were all taken up by other banana farmers doing the same thing. The fungus can live in the soil for decades without a host and eventually it acquired the ability to infect the Cavendish banana that was the savior for the Gros Michel. There are hypotheses that the Cavendish bananas actually evolved defenses for protection while the fungus was trying to infect them. The Cavendish seems to be losing this fight for survival. Banana exports have dropped by 46%, and countries are taking an economic hit. There are also some countries that tend to not use proper farming techniques that will help slow the spread of the fungus. In return, many researchers are trying to come up with a banana immune to the fungus and one may have found a solution. Using CRISPR, James Dale, a researcher at Queensland University of Technology in Australia, managed to genetically modify two Cavendish strains that are immune to the fungus. This could allow the banana industry to once again bounce back, without switching to a new strain of banana that the fungus could eventually jump to.